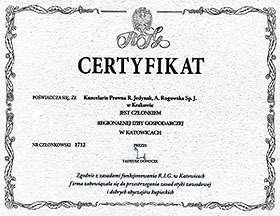 Our law firm was established in 1999, as an individual legal counsel practice, and since 2008 we have been operating in the legal services market as Kraków-based Kancelaria Prawna R. Jedynak, A. Rogowska spółka jawna. We have extensive experience working with companies which operate in the banking, chemical, shared services and call center business, as well as in the building, transport, waste management, environmental protection and medical industries. We also offer effective advice to individuals – primarily in employment, inheritance and administrative matters. The services provided by our highly qualified team of lawyers are tailor-made to meet the requirements of each case we work on and the expectations of our clients in order to find the optimum solution. In response to our clients’ needs, we offer a wide range of services using forms of communication which are most convenient and efficient for them. Legal assistance is provided under individual arrangements or on regular service basis and charged at hourly rates or under lump-sum arrangements. Przestrzegamy zasad etyki zawodowej i dobrych obyczajów kupieckich zgodnie z zasadami Regionalnej Izby Gospodarczej w Katowicach.